Dorothy’s ruby slippers could use a little more magic these days — or at least some preservationist TLC. The famous shoes from The Wizard of Oz are among the most popular items on display at the Smithsonian’s National Museum of American History. But they’re showing their age, and the museum is asking the public to pitch in to help keep the shoes intact for decades to come. The Smithsonian launched a Kickstarter campaign seeking $300,000 in donations to fund preservation work, research and a new display case. Three days in, the museum had received nearly $200,000 in pledges. 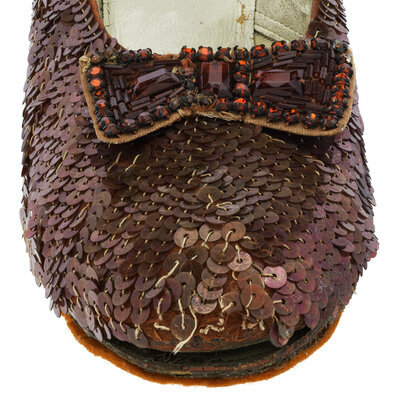 The museum wants to prevent any more deterioration of the shoes, which show clear signs of aging. The size-5 shoes in question are one of the few known surviving pairs that Judy Garland wore in the classic 1939 film. They were made a vivid red (unlike the silver shoes in the book version) to take advantage of Technicolor, and they are covered in sequins. This particular pair of shoes has been on display at the Smithsonian for decades, since being donated anonymously in 1979. But these days the ruby slippers are less spectacularly red than they used to be — and showing their age in other ways. The goal is not to restore the slippers to an earlier, more pristine state. Instead, the museum wants to fund research and work to determine how to “stabilize” the shoes and stop any more damage. That means figuring out the right temperature, light and humidity conditions for the shoes and building a new case to maintain that environment. The museum’s head of conservation told The Associated Press the case would probably need to contain a gas other than oxygen and have controls for barometric pressure. The slippers are delicate and made of multiple materials; curators say research is needed to determine the best way to store them. Preservationists will also treat the shoes to stop further loss of paint or sequins. “While the slippers undergo treatment their appearance will not change drastically, and we don’t want them to,” the Kickstarter summary says. Donors to the Kickstarter campaign can get posters, tote bags and T-shirts — or, for donations of $7,000 or more, their own replica ruby slippers. This is the second major Kickstarter campaign from the Smithsonian museum. Last year, it crowd-sourced well more than half a million dollars partly to preserve and display Neil Armstrong’s Apollo 11 spacesuit. The ruby slippers at the Smithsonian are among five known surviving pairs of red shoes from the film production (including the “Arabian Test Pair,” in a more ornate style, which was made for the movie but never actually used in the film). One pair was stolen from a museum in Minnesota in 2005 and has never been found. Another was purchased in 2012 for a planned movie museum from the Academy of Motion Picture Arts and Science that is slated to open in 2018.